ADS-B Technologies is an Anchorage, Alaska engineering and technical consulting firm that provides specialized air traffic management and air traffic control services. Specifically, it provides support in the deployment of Automatic Dependent Surveillance - Broadcast (ADS-B) and its related Communication, Navigation, and Surveillance (CNS) technologies throughout the world. Our Space-based ADS-B is also the only dual link (both 1090ES and UAT) system capable of tracking aircraft in real-time and with air traffic control accuracy and security, practically anywhere in the world. ADS-B Technologies' approach to Air Traffic Management (ATM) is based on our strong belief that we are currently entering a new era in aviation, the Global Satellite Navigation Age, in which the universal application of Global Navigation Satellite Systems (GNSS) and Automatic Dependent Surveillance - Broadcast (ADS-B), will trigger changes in global air traffic management on a scale surpassing even that which was seen during the introduction of Radar, more than sixty years ago. Its accurate and long range air-to-air capability has the potential to provide excellent collision avoidance and conflict resolution services. Our specific goal is to show nations and commercial entities how they can quickly adapt to, and then derive a significant benefit from, this new generation of satellite intensive Air Traffic Management (ATM) systems. We also hope that this site will provide you with up to date information related to ADS-B and its companion technologies. For further information, suggestions, or comments please Please Email us, or take a look at our Links page. ADS-B is radically new technology that is redefining the paradigm of COMMUNICATIONS - NAVIGATION - SURVEILLANCE in Air Traffic Management today. Already proven and certified as a viable low cost replacement for conventional radar, ADS-B allows pilots and air traffic controllers to "see" and control aircraft with more precision, and over a far larger percentage of the earth's surface, than has ever been possible before. 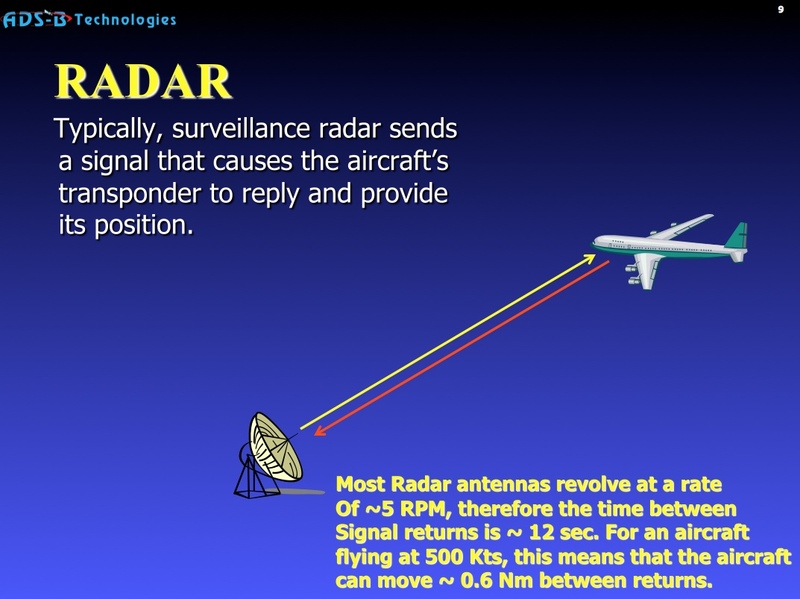 Far different from radar, which works by bouncing radio waves from fixed terrestrial antennas off of airborne targets and then interpreting the reflected signals, ADS-B uses conventional Global Navigation Satellite System (GNSS) technology and a relatively simple broadcast communications link as its fundamental components. Also, unlike radar, ADS-B accuracy does not seriously degrade with range, atmospheric conditions, or target altitude and update intervals do not depend on the rotational speed or reliability of mechanical antennas. In a typical applications, the ADS-B capable aircraft uses an ordinary GNSS (GPS, Galileo, etc) receiver to derive its precise position from the GNSS constellation, then combines that position with any number of aircraft discretes, such as speed, heading, altitude and flight number. This information is then simultaneously broadcast to other ADS-B capable aircraft and to ADS-B ground, or satellite communications transceivers which then relay the aircraft's position and additional information to Air Traffic Control centers in real time. The 978 MHz Universal Access Transceiver ("UAT") variant is also bi-directional and capable of sending real-time Flight Information Services ("FIS-B"), such as weather and other data to aircraft. In some areas, conventional non-ADS-B radar traffic information ("TIS-B"), can also be uplinked as well.